Bryan School students learned about career opportunities and networked with local business leaders on a recent trip to Volvo Group's North American headquarters in Greensboro. Thirty business students boarded a Spartan Chariot bus early on a Friday morning, dressed to impress, and eager to meet leaders at Volvo Group’s North American headquarters in Greensboro. 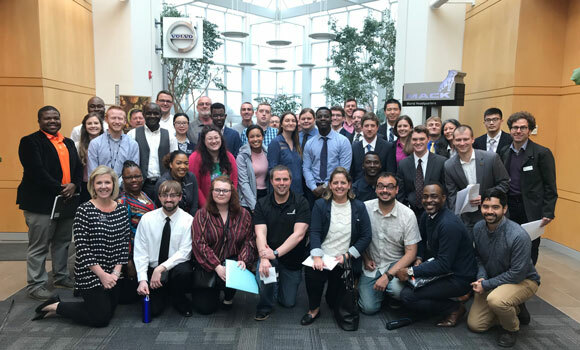 The students were part of a Bryan School of Business and Economics Company Trek, an exclusive opportunity to learn about career opportunities and network with local business leaders. The visit began with an overview of Volvo’s global operations group. Guillaume Giroudon, vice president of operations in North America, kicked off the discussion by introducing his team and giving an overview of production logistics and the global supply chain. Students were fascinated to learn how the logistics team in Greensboro oversees all shipments across North America, from Mack trucks to lug nuts. Bryan School alumna Katy Link ’16, ’18 MBA, district sales associate with Volvo Trucks and a member of the Volvo Group International Graduate Program, spoke about her background with the company. She first visited Volvo during a Bryan School Company Trek, then secured a summer internship, which led to a full-time position. She told students that meeting employers through company visits and campus events can be an important way to show that you’re eager and excited about joining the work force.